This is a view looking towards London from the viaduct; it’s the cutting leading into Brighton. I imagine it to be the width of the original London to Brighton, South Coast Railway. I also imagine this to be another view that the paying customer in the open carriages would have seen as he came into Brighton. Also in the picture are three ghosts of steam which have been purchased by a society and will eventually and hopefully be restored. Please would you identify the three steam locomotives. The Pembroke Dock Steam Locomotive Preservation Group would be very interested. I went to Cornwall about 5 years ago and I believe these trains came from the disused Camel Trail. You can see the photos of these in a museum in Padstow! I enquired about this rolling stock at the driver’s office at Brighton station. 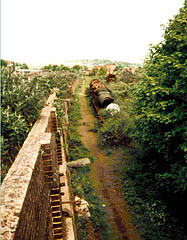 I was advised that they had been removed several years back from sidings adjacent to the station, prior to the recent redevelopment but I personally would be interested exactly where and when the photo was taken, as the redeveloped area as I remember it did not have as much foliage as in the photograph. So, where there two sites with abandoned locos ? The locomotives in question were indeed rescued from Barry scrapyard in South Wales and were intended to be restored in the old carriage works at Preston Park. Two of the locos were “merchant navy” class 4-6-2’s the first is Shaw Savill line and the second is General Steam Navigation. These were designed at Brighton, but may have been built at Eastleigh, not sure on that. The third is I believe, a GWR 2-8-0 type goods engine. All locos have now moved Shaw Savill to Lancashire, General Steam Navigation to ex RAF Binbrook in storage, the GWR loco I don’t know, sorry. One of the locos was 34046 Braunton, a West Country Class Bulleid Pacific. This was the last to leave, and I think it is now at the Mid Hants Line. 34046 is now on the West Somerset Railway, I believe. The GWR loco was supposedly the Barry commemorative locomotive, being the penultimate one to leave Woodham’s Yard. This was 28XX number 3845 and is now at Swindon & Cricklade Railway. The West Country/Battle of Britain locos were all built at Brighton whilst the Merchant Navy class were built at Eastleigh. Those with the air casing removed were all rebuilt at Eastleigh.